Here’s an easy way to re-purpose wire plant stands into garden and deck side tables. Earlier this year, I featured several of my favorite home decor areas I called reading nooks. These areas are designed to invite people to sit down and talk, read, nap - basically slow down and enjoy the moment. One of the handy items to have for these outside nooksare usually available this time of year at our local garage sales and thrift shops. That’s where I found the ones I now use as handy side tables on my deck, and also in the hallway into my house from my garage. Although practical for plants since the wide rungs allow water to run through, wire plant stand surfaces are not practical to hold other items without knocking them over or loosing them through the wide rungs. With a very simple addition, you can turn these sturdy wire plant stands into practical tables for use all year around. One of the pre-used wire plant stands I re-purposed into an outside side table with plexiglass. This is an example of a typical wire plant stand. Some are more like small book cases, others have these three-tiered levels. You can use as is with a little patina on the paint or re-paint them with a good metal paint. I use mine after a good cleaning as I found them. The simple trick is to have a glass store cut 1/4 inch plexiglass pieces to fit the different rungs. I took the wire plant stand in and left it with them so they could cut the custom pieces to fit. In this example, the plexiglass pieces cost around $20. You can also get 1/4 inch glass with rounded edges cut to fit the shelves. I chose the plexiglass because this will stay outside and possibly get blown over by wind and I didn’t want to risk the glass breaking. Glass is better if you expect a lot of use and will cost more. It will also add more weight to the wire plant stand. Plexiglass is lighter and easily scratches so choose whichever better fits your lifestyle. Here is the wire plant stand with the top shelf covered in plexiglass. To install, I just removed the protective paper and popped the plexiglass piece right into the shelf. Custom cut plexiglass will cover each of the wire plant stand rungs to make them solid. Our local glass store did a nice job of cutting corners into the pieces so they easily fit. Once covered in plexiglass, the wire plant stand is ready for use as a side table to deck furniture. You can also drill holes on the corners and attach them to the plant stand with wire or fishing line. I leave mine sitting on the shelves for easy removal. Here’s the plexiglass-covered wire plant stand as a side table with 3 different levels. I also use the same plexiglass-covered shelving in the hallway into my house from the garage. The square wire plant stand holds my first aid basket and other handy items in a collection of baskets that sit on the plexiglass. Similar baskets on the plexiglass-covered wire plant stand work well for handy storage. The plexiglass covered tiered-wire plant stand is now sitting next to my deck sofa. The size is perfect for the close space and now easily holds my tea tray. Wire plant stand tables are a good size to fit into narrow spaces next to deck sofas. The tea tray also has a piece of plexiglass to cover the bottom of the wood tray to protect it from glass and cup rings. A dab of clear glue can hold it down if you want something more permanent. I have it sitting on the tray for easy later removal and cleaning. To make the wire plant stand table more versatile, I found a basket for the second rung that now holds some reading options. Add baskets to the wire plant stand shelves for easy handy storage. 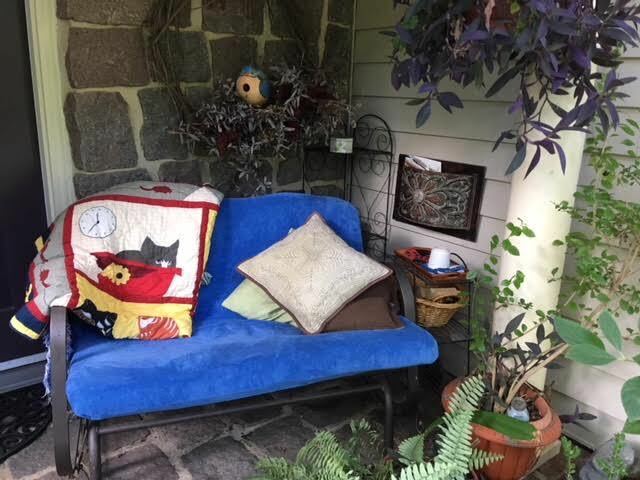 I am still working on what to put on the bottom rung and hoping for a good rainy day so I can sit on the deck with a cup of hot tea wrapped up in the Cat Mischief lap quilt throw reading a good nearby book. It’s a good place to watch the garden grow, too. My front porch reading nook now with the wire plant stand side table. I found new baskets for the wire plant stand table, this one expands the space as a little side desk. My new find, a sectioned basket that can work as a small desk next to my porch swing. On second thought, maybe I can sit down now without it raining first!